The setting moon created a surreal scene for our night at the Hidden Dunes. 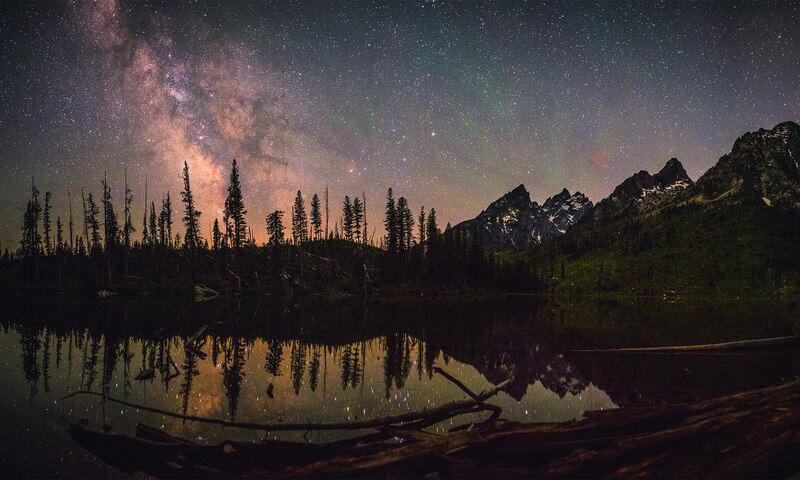 Nighttime landscape photography creates a feeling in me that is unlike any other. To look out at the heavens and see where we are in the universe is, as Carl Sagan put it, a humbling and character-building experience. I find it amazing that on a clear sky night, I can look out and see other planets, other solar systems, and other galaxies. A clear night sky transforms our planet into something seemingly extraterrestrial, as if suddenly I was an explorer in a far away star system and a strange and beautiful planet. We set an alarm for 3am. I think that it was only the excitement of what strange and unusual photography that I would be able to create that helped me wake. 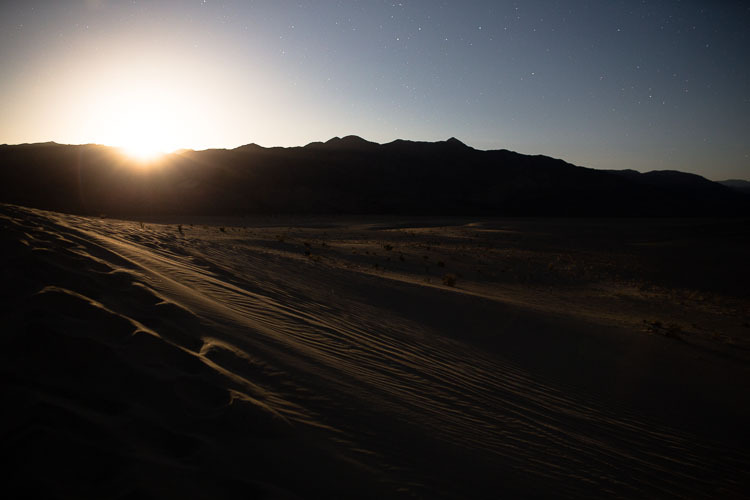 After hiking several miles with a 50lb pack and running around and the sand dunes the day before, it would be difficult for anyone to want to relinquish their sleep only to do it again, in the cold dark. After snoozing the alarm for 5 minutes, I sat up and peered through a small vent in the tent. The moon was suspended low in the sky, like a strange nighttime version of the scene I just saw when the sun set a few hours before. 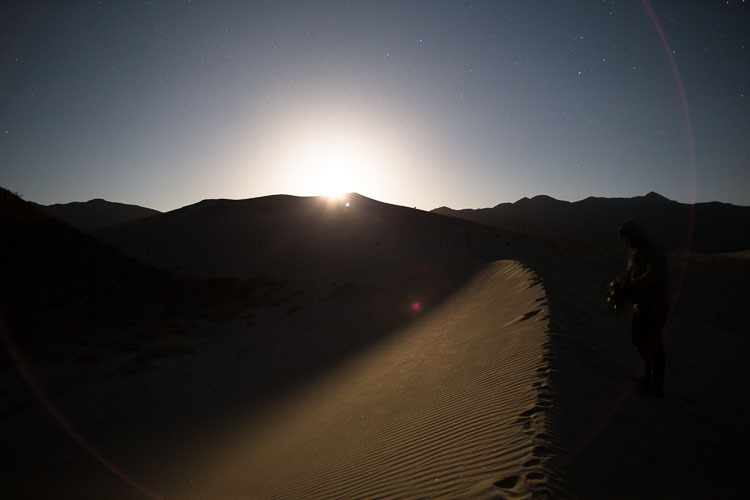 Long shadows stretched along the sand and curves and sharp edges of the dunes were hightlighted in the moonlight. We scrambled in our tired state to get a brew of coffee made and prepare our camera equipment. We had a few SLRs with wide angle, fast lenses, tripods, intervalometers and my new fangled motor driven equatorial mount for tracking the sky as the Earth slowly rotated. The moon was setting quickly so we scrambled up the mountain of sand as quickly as we could to be able to catch the moon before it was gone. It seemed like a significantly longer and more arduous hike in the dark, we were racing up the hill as the sand seemed to drag down each footstep, trying to beat the moon as it set. each step up and the sand would sink a half step down. It was hard, lung burning work. I snapped a shot of the last ray of light on the bottom portion of the dunes as quickly as I could setup my tripod. Cody was in front of me trudging up the sand mountain. From that point on, we were racing up the hill in its shadow with our legs burning from the sand that pulled back every step. 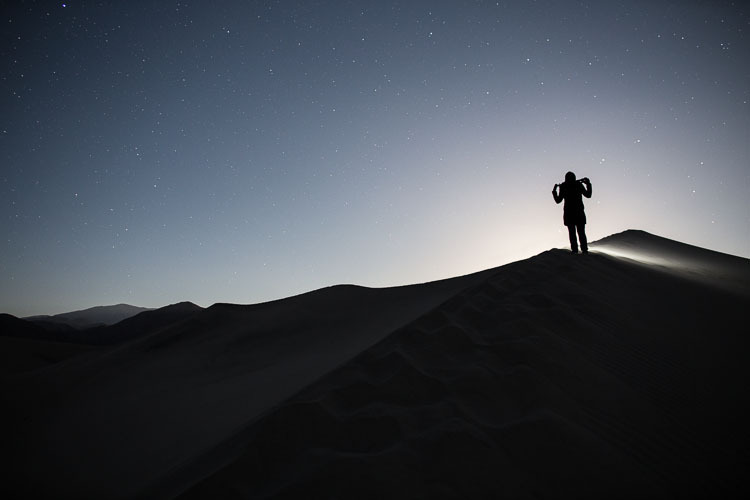 As we neared the summit of sand dune, I yelled out to Diana (I hardly needed to yell at all it was absolutely silent out) to stop where she was and grabbed a quick shot of her silhouetted against the blue starry sky, her headlamp lit the summit. 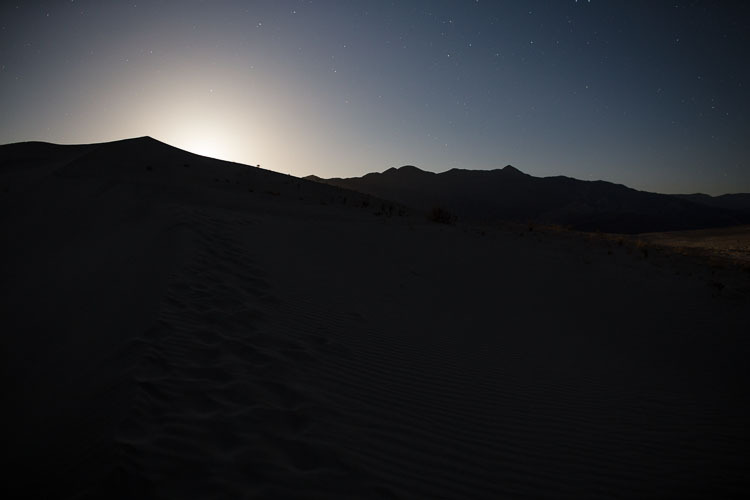 Her tripod was hoisted on her shoulders as she made the hike, making for a strangely shaped cutout.I trailed behind both Cody and Diana and so right as I reached the summit of the sand dune, the moon was at the edge of the distant mountain peaks. The cold light accentuated the ripples in the sand and the divots we left with our feet the day before. If the hour before sunset or after sunrise is called magic hour, the hour before the waxing moonset or after waning moonrise should be too. I can’t thing of a more unusual and unique form of natural light than that of a low moon setting under a blanket of stars. The moon was down around 4am, giving us about 2 more hours of pure black in the skies before the sun would start to rise. Although it was nearly a full moon, I was counting on getting at least a few photographs of the milky way before the sun rose. I had two cameras at my disposal for such shots. The first was my DSLR (Canon 6D) with the Vixen Polarie star tracker, the smallest equatorial motor drive that I could find for such outings as this. Basically, it allows me to align an axis of rotation with the axis of rotation of the earth. So as the Earth rotates relative to the stars, the camera can track the stars, preventing motion blur from “trailing” the stars (which sometimes is a really cool effect). The other was my small mirrorless camera (Fuji X-E1) and a miniature tripod (Ultrapod II). 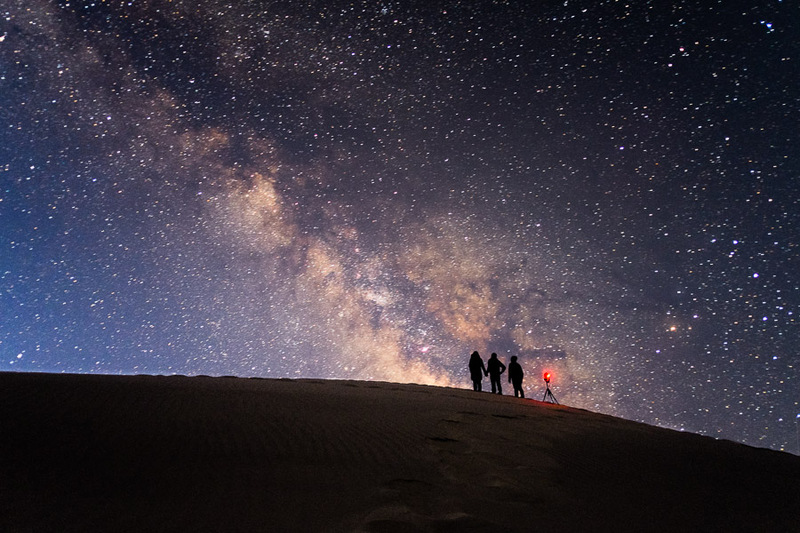 The galactic center from the top of the Hidden Dunes, Death Valley National Park. 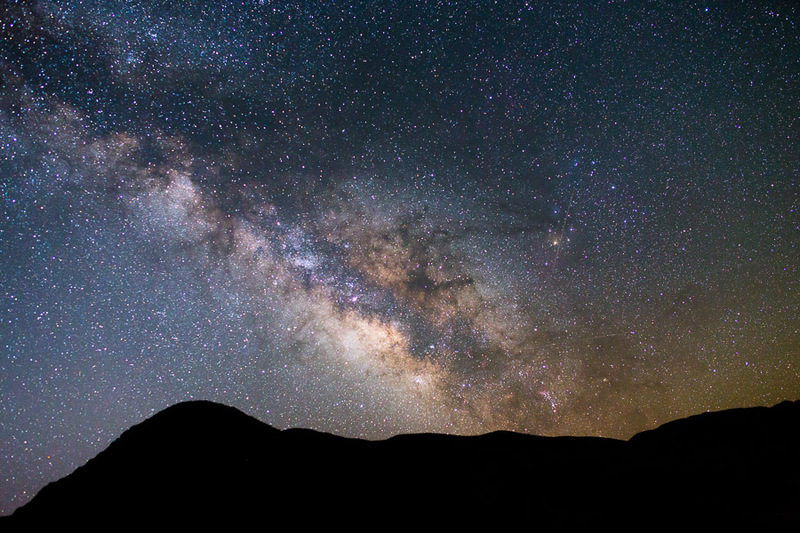 I setup the SLR with the equatorial mount on the top the the sand dune, looking Southeast toward the hazy stars of the Milky Way and setup a time lapse of exposures of the Milky Way rising above the nearby rocky mountain. The star tracker kept my camera pointed toward the center of our galaxy the entire time, the earth slowly rotating out of view. One of the most interesting things when watching the time lapse was the amount of satellites ans shooting stars that passed overhead. And as the time lapse of clicked away, I trudged down the dark sand dunes just below and found a flat spot to setup my little Fuji camera, also pointing toward the galactic center. I set the intervalometer to perform a time lapse as well, this time with the sand dune in the foreground and my previously setup tripod in view. Then, Diana, Cody and I all met back up at the top of the hill and stared at the rising milky way.The “write light” on the 6D glowed in the dark like the cyclops eye of a robot, perched on the hill. My sister nerded out at this sight on an instagram post of the image saying: “It looks like Cody is standing next to a giant bacteriophage that had been genetically altered to express red fluorescent protein.” I guess all I can say is I’m an engineer, she’s a biologist. This last image, I would say, is the photograph that explains best why we came to the Hidden Dunes. Cody, Diana and I look out at the Milky Way. Someone used your Milky Way photo and claimed it as their own on Facebook and Instagram after photoshopping a waxing gibbous moon over it and altering the colors. Her name is Carina Mcglasson. Instagram name is @carina_mcglasson … as a fellow photographer I knew i should inform you.